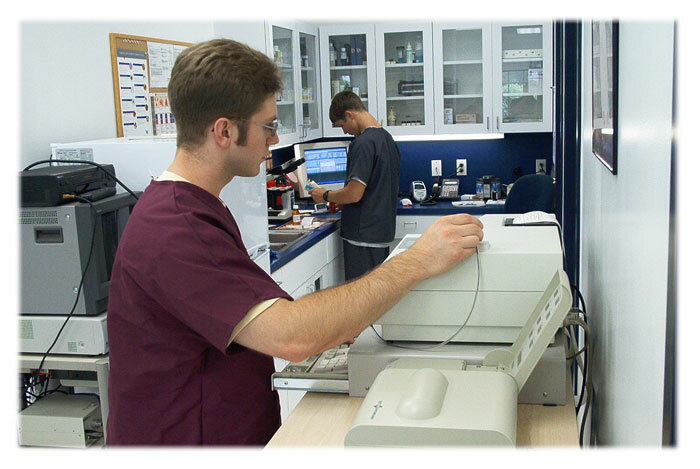 In-house laboratory equipment allows us faster access to vital information about your pet. We can diagnose and treat the problem faster than when we had to send every sample to outside sources. Our laboratory allows us to test the levels of a number of important enzymes and elements which can give us an indication of the health of several important body systems, including liver, kidney, pancreas and others. This is helpful in narrowing the focus to an organ system, as well as, testing for the safety of anesthesia and surgery and for drug monitoring. Our laboratory equipment includes the newest chemistry analyzers, blood gas and electrolyte analyzers, as well as, a CBC analyzer. We also perform in-house cytology using the microscope which we can patch into our video otoscope system. In this way the images can be stored, added to the medical records, or shared with another doctor via the internet. We also use a number of disease specific antigen and antibody tests which can give us immediate results about certain diseases.